The English language, or at least the adherents thereof with more time on their hands than sense, has bestowed us a great number of names to collective nouns for groups of birds. One can only assume that somehow they were unaware that a perfectly good word, flock, existed, and then plundered an innocent thesaurus to find whimsical (read:idiotic) terms like an unkindness of ravens, a flamboyance of flamingos or (worst of all) an exaltation of larks. Honestly, it’s enough to make me wish I was a native speaker of German. English has not been similarly encumbered with frivolous names for young birds of specific types. There are a few, mostly confined to domestic or game birds that people may be familiar with at all stages of their lives – young pigeons are squabs, ducks are duckings, swans are cygnets, geese are gosling. One website I found suggested a few others that may be true but I hadn’t encountered before, are young cranes actually called colts, or falcons eyas? They may be, but the names haven’t caught on. The site also seemed to suggest a few that seemed flat out wrong; parrotlets aren’t baby parrots, they are a type of small parrot, same with owlets and peeps. 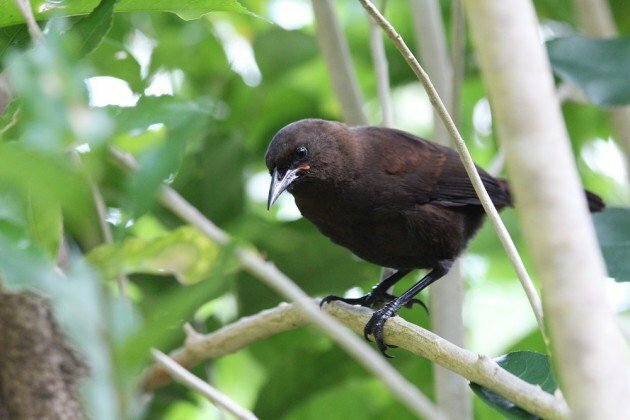 But there is one such bird in New Zealand, and it is, as far as I know the only songbird where the young bird has a unique name (I’m sure I’ll be corrected in the comments). 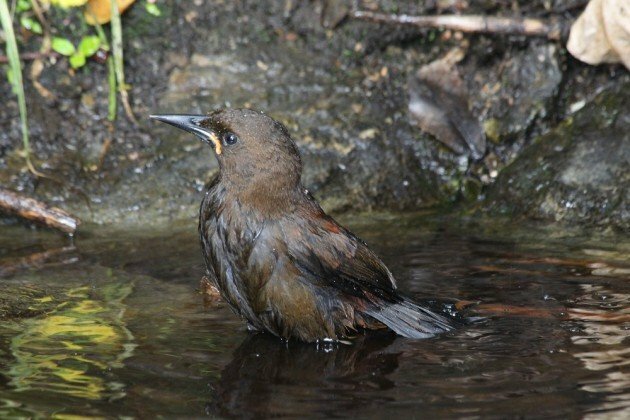 On South Island, in a very few places, you might find a Jackbird. Jackbirds are young South Island Saddlebacks. South Island specifically, and in fact it was the marked difference between the young birds of this species and the North Island Saddlback that alerted scientists to the fact that they were two separate species. 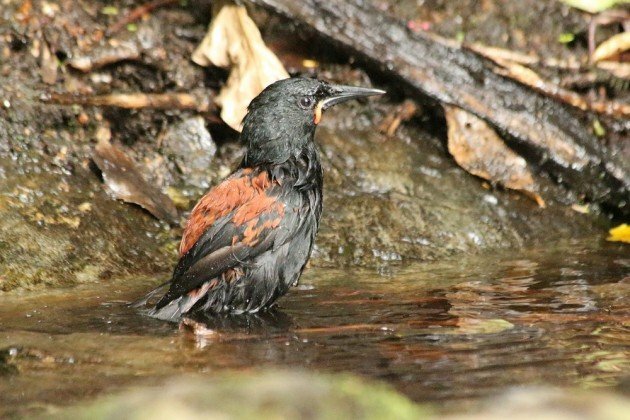 Whereas the plumage of the young North Island Saddleback resembles a small-wattled adult, the young South Island Saddleback is uniformly brown. This adult still has some brown on the neck, but fully developed wattles. 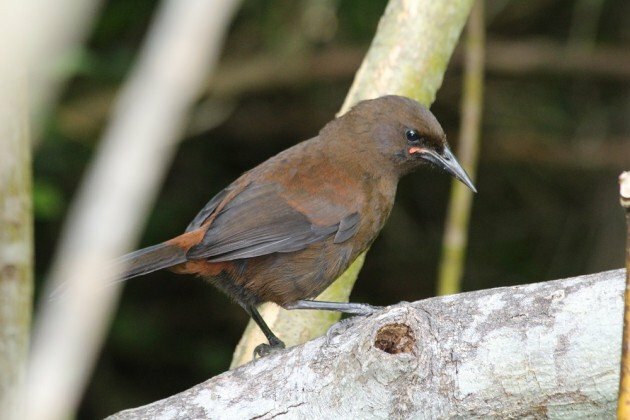 The saddlebacks are both members of the of the New Zealand wattlebird family, which includes the two kokako (one extinct and one….. probably extinct) and the sadly lost Huia. 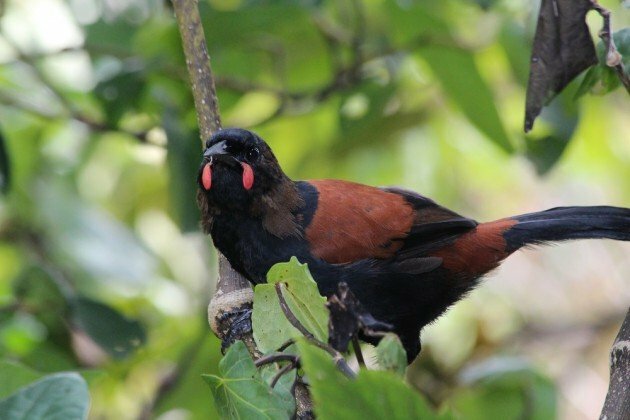 Like the Huia and kokako the Saddlebacks suffered with the introduction of mammalian predators, and in fact the South Island Saddleback came breath-takingly close to extinction. It’s last island habitat, Big South Cape Island, had succumbed to invasive rats, which were wiping out the saddlback, along with the Greater Short-tailed Bat, Bush Wren and South Island Snipe, all of which were also making their last stand on the island. Conservationists pioneering translocation to a safe island managed to save the saddlback, but not the others. 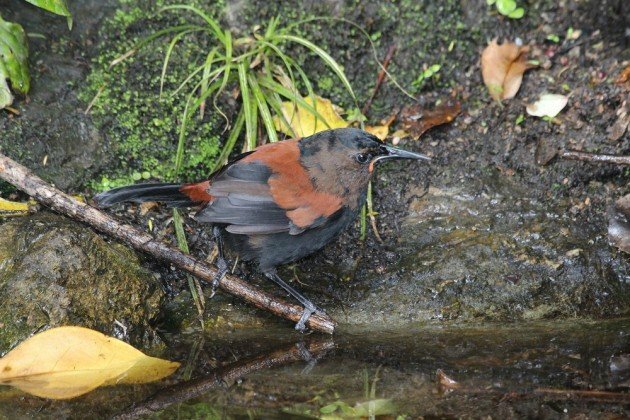 Today the South Island Saddleback is increasing in numbers as the Department of Conservation moves them around offshore sanctuaries. I saw these birds, including the Jackbird, on Blumine Island and Motuara Island in Marlborough Sounds.